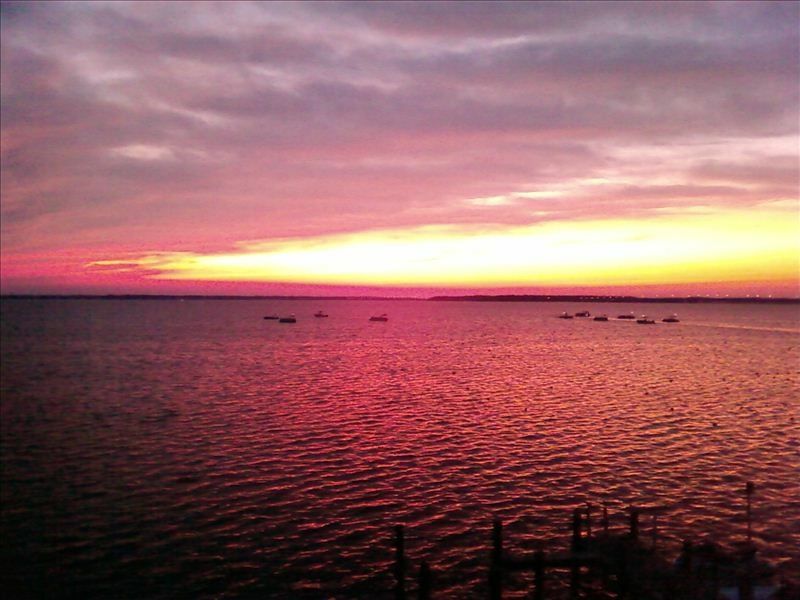 Wight Bay - 2BR/2BA Direct Bay Front - Stunning Bay View! Children are allowed under the age of 17 accompanied by parents. Direct Bayfront 2 Bedroom Condo just steps to the Bay! This is a very desirable unit with a direct view of the Bay. The unit is available for weekly rentals from June through September! The rest of the time, we offer seasonal rentals, weekends and nights, with a three-night minimum. Our unit is within close walking distance to a stop light, which then leads directly to the Ocean beaches only one block away! Okay – now let’s talk about the views. This is a direct bay front unit and each bedroom has a window that looks out onto the bay with no obstruction. From all rooms in the unit (except bathrooms), you can see the bay. In the evening when the sun sets, the bay looks like an infinite pool of sparkling jewels – it just fills you with tranquility. At night when the moon is over the bay, it looks like an amazing, shimmering path being lit to wherever your mind takes you. The unit is a very comfortable and spacious place to be, but it is the sights and activities that the water has to offer that will make the memories you create here priceless. It’s a healthy and happy experience. A few facts about the unit: the kitchen is fully stocked with dinnerware, pots, pans, utensils, small appliances, and an electric stove. We have a two seat breakfast bar, and a dining table that seats four. Again, you can see the bay directly from the dining room and kitchen. The living room offers a queen size sleeper couch. There is a television with a DVD, and sliding glass doors that open to your deck and direct bay view. The Master Bedroom has a queen size bed, a large dresser and walk-in closet, a television, a private bathroom, and a windowed slider that opens directly out to the deck and bay. The second bedroom is a spacious room with a large dresser and walk-in closet, television, and one queen sized bed. Again, there is a window with a direct bay view. Both bedrooms have plenty of lighting. There is a private bathroom in the second bedroom. The condo has a full size washer and dryer complex in the building. Bad weather is not an issue at our Condo. Our tenants will find a television in each bedroom, and a television with DVD in the living room. We have WiFi Internet capability also. Our unit is a great place to stay for golf trips, Convention Center activities, Spring and Winter Fests, and tax free outlet shopping in Delaware. The Condo also offers an outdoor pool. This is a third floor unit in a five-story masonry condo building, with an elevator. The unit has a large open deck accessible from the Living Room or Master Bedroom. Your deck offers views of the bay and the Seacrets nightclub. The unit is cared for, and offers secure, off-street parking, in a private lot. The location is only a two block walk to the ocean and beach, with many restaurants to choose from. Wight Bay offers attractive landscaping, picnic benches, fish cleaning station, and a beautiful pool for swimming and sunbathing, while overlooking the bay. The unit features a new, equipped kitchen with cooking and eating utensils, microwave, toaster, coffee pot, stove/oven and full-size refrigerator/freezer. The kitchen overlooks a breakfast bar and dining room with table/chairs for 6. A spacious living room offers comfortable seating, cable TV, DVD and a queen sleeper sofa coach. The living room and master bedroom accesses your private deck. This location is in mid-town Ocean City, perfectly situated for accessing the beach (two blocks), amusements, activities, dining, etc. A very easy walk to everything. A public bus route offers affordable public transportation throughout Ocean City to all attractions and beach areas. No smoking is allowed in the unit, but ash trays are outside on the deck. No pets are allowed by the Condo. If it is discovered you have a pet, security will evict you and your rental money will not be refunded. We are sorry, but we do not rent to high school students or group rentals. You must be 25 years of age to rent, and be able to prove it. Families only please. A $300 Security Deposit is required. Off season, partial weeks (Three night minimum) = $150/night + taxes (10.5%) + maid service, but June thru Sept full weeks only! Several washing machines and dryers on first floor. Board Games, Jig Saw Puzzles, etc. Exactly as it is in the pictures. Dorothy is great to work with. We had a small issue with one of the doorknobs getting stuck, but her contractor came by right away to fix it. We come to Ocean City every year and this has been one of the best stays we have had. Beautiful view, very comfortable condo, and great location. I would highly recommend to anyone. Thank you so much Dorothy and Steve! We are looking forward to coming back next year. We had a wonderful stay! The size and location was just right for us! The owner was pleasant and available for questions! Had a wonderful stay at the Condo. Pic's are exactly what is described. Condo is right on the Bay,to the left of Seacrets. Perfect/relaxing + the exceptional water view of the Bay + sunsets from our deck, where we relaxed in the morning with a cup of coffee + in the evenings with a glass of wine, listening to the music from Seacrets. (which is not loud, but very entertaining). Weather was not cooperative, but we made the best of it. Bethany for a few hours of shopping, Casino(15 minutes up the road), Boardwalk for sites + sand sculptures, Ocean City Brewery for a fun tour + delish appetizers, Bonfire buffet was excellent + most definitely the highlight was Assateague State Park where we got up close to the Ponies. Condo is very clean. Dorothy is a gem + easy to get in touch with any concerns. We were 4 adults. Bayside bedroom, with balcony, had a wonderful view of Bay,shower stall is a little tight + smaller than the other bedroom. 2nd bedroom was larger, bathroom with tub + had a wonderful side view of Bay. I highly recommend the Condo + location is perfect. Easy 1 block walk to the beach. Will look no further + will definitely rent again. Great location! Fun, fun, fun in the sun! This was our first time renting this condo and the mid-town location is what we like the best. We loved the nearby restaurants like the Ocean city brewing company (which had the best wings) Dumser's ice cream parlor, Belly Buster's and ofcoarse Seacrets!!! It was a short walk to the beach and we enjoyed lounging by the pool. The condo was the perfect size for our family of 4 with some room to spare. The bay view was fantastic and so relaxing. The owner was very sweet and helpful. Thank you for sharing your condo with us. We can't wait until vacation next summer already. Hope to rent your place for next year again. We had a wonderful time at this unit! My family and I stayed here recently and really enjoyed our stay! The owners were very friendly and helpful in getting us set up. The unit was very clean and the furniture, couch and beds were all clean and bright. There were many nearby restaurants, places to shop, movie theaters, etc. The front deck was quite large and the view of the sun setting in the evening was spectacular! We were also very close to the beach! Also, we liked being on the third floor (not too high and not too low). Anyway, we definitely plan to return soon to stay again! This condo was the best yet.....THE VIEW IS SPECTACULAR !!! The condo is very well appointed. If they don't have it you don't need it !! We loved everything about this unit. We will be a repeat. I couldn't have asked for a better owner to work with and I can't wait for next year ! !